Goomboss, originally known as the Goomba King, is one of the first bosses that Mario and Goombario encounter in Paper Mario. He later reappears as a boss in Super Mario 64 DS and Mario Kart DS. He is one of the few original Paper Mario series characters to reappear in other Mario games, along with Whacka, Koopatrols, and the Star Spirits. His name is a portmanteau of "Goomba" and "boss". In Paper Mario, he was originally an ordinary Goomba, but Bowser used the Star Rod to make him a king (which also greatly increased his size) under the conditions that he would assist Bowser later on. He is first seen when the Goomba Bros. come to his fort wailing about their defeat to Mario. He lets them in his fort, and when Mario comes by, he has a short conversation with him and then engages him in battle along with his minions. In battle, he is accompanied by Red Goomba and Blue Goomba. Mario will find him by his Fortress. The easiest way of defeating him is to hit the Goomnut Tree at the start of the battle to make one giant Goomnut fall on him and the Red and Blue Goomba, doing three damage and instantly knocking the weakened Goombas out. When the Goomba King is defeated, he surrenders and retreats to his fort while pleading that Mario will not press a nearby switch. When Mario presses the switch, the fort reveals to be a bridge used to get to Toad Town, and he and his minions fall into the abyss, defeated. While Mario battles the Goomba King and his lieutenants, Red Goomba and Blue Goomba, Kammy Koopa is secretly observing the battle. She reports back to Bowser, who is furious at the Goomba King's defeat and also yells "I only used the Star Rod to make him a king because he begged me to...". In the ending parade of Paper Mario, Red and Blue Goomba are trying to get the Goomba King out of a tree. He then falls out, and dizzily wobbles off the screen, followed by the Goomba Bros.
Goomboss in Super Mario 64 DS. 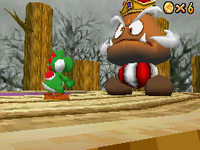 The Goomba King reappears as a boss in Super Mario 64 DS, now called Goomboss. The battle arena can be reached after eight Power Stars are collected. In order to defeat him as Yoshi the player must eat Goombas and spit them back at him in the form of an egg to win back Mario's key in order to unlock him as a playable character in the game. However, Goomboss starts getting faster, redder, and angrier after every hit and also gains more Goomba followers. He needs to be hit three times in order to admit defeat. When returning back to fight him once again as Mario, Luigi, or Wario, they can punch him in his face and obtain a Super Mushroom. Using it and attacking him while under its influence is not required to defeat him; the player can just punch the Goombas into him to damage him. After he is defeated, Yoshi gets the Mario key, which is used to unlock Mario. This appearance also proves that he knows Luigi but he does not know Wario. Also, when hit, every normal Goomba runs up to him, as if worried. He sometimes even tramples his own Goombas. Goomboss racing Toad in Mario Kart DS. 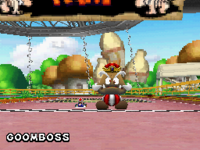 Goomboss reappears the missions mode in Mario Kart DS, where he appears as a boss, where the player, playing as Toad must complete three laps of the Baby Park track before Goomboss does. After each lap, Goomboss becomes bigger and angrier, but he has to stop for a few seconds to grow, giving the player a chance to pass him. Another chance to pass him is when he stops to throw one Goomba on the first lap; one or three Goombas on the second lap; or one, three, or five Goombas on the third lap. If the player hits a Goomba, the player will lose one of his three balloons, and if the player loses all three balloons, they will fail the mission, although the player will not lose a balloon if he hits Goomboss. Occasionally, Goomboss will throw a Mushroom instead of a Goomba, allowing the player to get a boost of speed. Additionally, on the third lap, Goomboss will cheat and hop over the center divider, improving his chances of winning. If the player is in front of Goomboss, he will not stop to toss Goombas but will run faster so he can catch up. Tattle This is the Goomba King. He's really big. I mean, look at him! He looks really powerful. Max HP: 10, Attack Power: 1, Defense Power: 0 He's the boss of Red Goomba and Blue Goomba. Who cares if he's strong? You're much stronger. Gee, I wonder what he ate to become so big? I'd like to be a bit bigger, too. Kuri Kingu Literally "Chestnut King", but the Japanese name of Goomba, Kuribo is also derived from chestnut (「栗」 kuri). The Chestnut King, an implied character from Luigi's stories in Paper Mario: The Thousand-Year Door, shares Goomboss's name in the original Japanese version and many non-English translations of the game. Goombas are known as kuribō, meaning "Chestnut People", in Japan, which is where Goomboss's name is derived, whereas the Chestnut King may be following the convention of food-related Waffle Kingdom names. It is unknown if they are meant to be the same character, as Goomboss was never said to be an unwillingly transformed monster as he is in the final Super Luigi book, and he has appeared since Paper Mario: The Thousand-Year Door's release. However, the books embellished and outright made up many details that were not in Luigi's spoken accounts while contradicting others, and the detail of him being unwillingly transformed is unique to the books. This page was last edited on March 18, 2019, at 15:59.